Alien invasion is a subject we have become more and more interested in of late, thanks to the likes of the X-Files, Taken, Signs and The Faculty, but in The Midwich Cuckoos, John Wyndham gives us a classic but still frighteningly original take on it. The Midwich Cuckoos opens with Richard Gayford (the novel�s narrator) and his wife Janet returning from an evening in London, celebrating his birthday, to the English village of Midwich, where they have recently moved. Midwich is your typical quiet, sleepy, 1950�s English Country Village were nothing unusual ever happens. Except this day Richard and Janet find they cannot enter Midwich, all roads are blocked. So they set off, on foot, across the fields, only for both of them to collapse, unconscious, in their tracks. The army, who are trying to keep everyone out because Midwich is incommunicado, rescues them. Everyone in the village is unconscious, as if they collapsed were they stood, the same happening to anyone trying to enter the village. An invisible force surrounding the village. This lasts for twenty-two hours, then everyone wakes up as if nothing has happened. There are no bug-eyed aliens or reptilian creatures fighting humans, instead there are strange children who look and behave human, but are not. As they grow up, the children begin to show nonhuman-like behaviour, slowly stretching their power over the villagers. As an alien invasion this is an original and disturbing approach, to use humans as hosts for the aliens and get the humans to actually raise and protect the �cuckoos� in their midst. Also, this is an implied alien invasion; no one names it as such. John Wyndham gives us a slow burn, slowly and piece-by-piece telling the reader what is going on, slowly revealing the nature of the children. Yet his characters are still all too real, displaying that all too human trait of, when faced with the extra-ordinary, simply accepting it as ordinary. He also taps into some of our fundamental fears, that our children are not our own but have been substituted by changelings. I first read this novel as a teenager and it frightened me, coming back to it as an adult I find it just as disturbing but for different reasons. This invasion almost mimics the way a virus attacks a body. It is such a simple but very original premise. 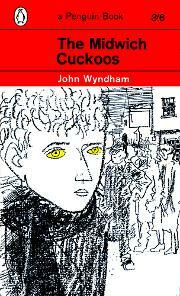 The Midwich Cuckoos is set in 1950�s England, when it was written, and so reflects the attitudes and prejudices of the time, children born out of wed-lock are a source of embracement and class rules everyone�s relationships. This only adds to the atmosphere and feel of this novel, the setting so real that it makes the extraordinary events, that slowly unfold, seems real as well � only adding to the horror. In my opinion, John Wyndham should be held up there as one of the greats of science fiction, though he seems to have slipped down in people�s memory. If you are new to John Wyndham�s works this is an excellent way into his dark universe, if you red this novel many years ago give it a new look � it has lost none of its impact and is also now strangely relevant.